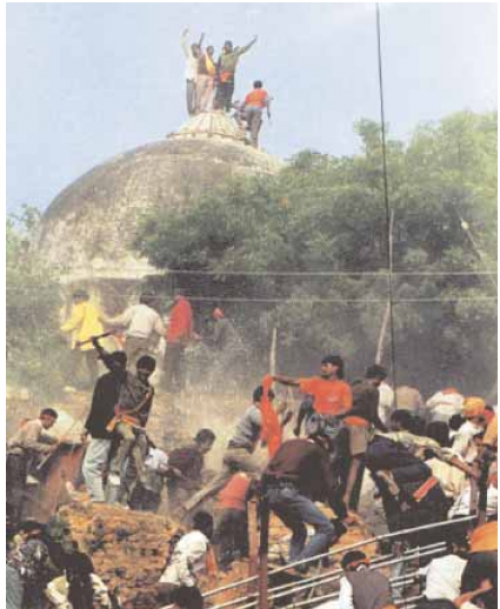 Editor's note (April 19, 2017): The Supreme Court ordered speedy trial of the Babri Masjid demolition case, while restoring criminal conspiracy charges against senior BJP leaders. Even 24 years after the demolition, India’s courts and law makers have not been able to resolve the issue. It is clear that communal harmony cannot be handled exclusively as a law-and-order problem. What are the alternative approaches? In the following article, published in the aftermath of the Babri demolition, Down To Earth had examined one such approach borrowed from natural resource management. It asked: can participatory politics in the maintenance of urban communal harmony and peace produce the same positive results as it does when dealing with rural natural resource management? DOWN TO EARTH has been consistently arguing that people's self-management and control are the best ways to deal with the critical problems facing India, namely, declining productivity and the steady destruction of natural resources such as forests, grasslands, ponds, tanks and wetlands -- problems that result in extreme poverty and drudgery and which threaten the daily survival of millions in the country. This is a powerful thesis based on real-life experiences of village communities that are actively battling ecological decline and the crises in their daily lives. Regardless of what urban-based administrators and intellectuals may think, the ecological crisis is definitely bringing forth a social response, though it is small at the moment. Despite adverse odds, several communities have successfully regenerated their environment. Their experience is a pointer for the country's policy makers who are devising strategies to arrest ecological decline. In l986, when Prime Minister P V Narasimha Rao was the minister for human resources development, he was shown a presentation on the State of India's Environment and told people's participation is crucial for environment management. Back came his prompt comment: "But this is true for almost everything else." During the past few months, India has suffered the traumatic experience of being rocked by communal disharmony and large-scale urban violence. The country's law-and-order machinery has failed to stem the rioting, which has taken a heavy toll of lives and property. The mindless violence has been widely criticised abroad and shattered India's image of a non-violent nation. The question that we have raised in this issue of Down To Earth is: Can participatory politics in the maintenance of urban communal harmony and peace produce the same positive results as it does when dealing with rural natural resource management? And, in answering the question, we have followed the same approach that we normally take when analysing resource management questions. That approach is to try and identify successful examples and then dissect them to understand what made them succeed. Deplorable as it is, at least nine major cities in India, including Bombay and Surat, were seared by flames. But another large part of India did not and the question to which we sought answers is: Why not? In the three case studies presented in this issue, namely, Bhiwandi (Maharashtra), Bhagalpur (Bihar) and Okhla (New Delhi), we report on the vibrant community initiatives that we found were behind the maintenance of peace and communal harmony. It is the relevance of these initiatives that we have tried to present in detail. The first factor that Indians must recognise is that the mainstream political system is increasingly incapable of dealing with the problem of breakdowns in communal harmony. In many ways, mainstream parties of the entire political spectrum -- from the BJP to the Congress(I) to the CPM -- have played a key role in segmenting the Indian polity along community and caste lines to nurture their vote banks. Democracy, built exclusively on the ballot box, has failed to prove adequate and, in some ways is dangerous. In riot-affected areas, our survey reveals few people looked to political parties to give them either protection or succour. Even a party as vocal about secularism as the CPM failed to protect the people of Calcutta, where it is the ruling party. Even as the country's political processes are deliberately segmenting the polity, economic growth and urbanisation also seem to be working in some instances towards the destruction of social cohesion. A fast-growing city with a large immigrant population and lacking institutions that can develop and maintain inter-community harmony, easily becomes a tinderbox needing only a spark to ignite it. Even a town that once had effective community institutions, can easily wither away under the impact of rapid modernisation, unless a conscious effort is made to maintain or develop them. In these situations, social amorphousness can have such frightening dimensions, residents of a building may join a marauding mob and loot their neighbours. When land becomes a scarce and precious resource, as is the case in many metropolitan centres, economic vested interests will seek to exploit heightened communal passions and target specific settlements to capture their resource base. Adverse administrative systems also force neighbourhoods to an "outlaw" existence. Illegality is not inherent in a situation; it is the artefact of the state. Extinguish all rights of the people in a forest and every firewood-picker immediately becomes illegal. Much of urban India's population lives in illegal settlements and so they are forced to search for power-brokers who know how to operate outside the pale of the law and provide the residents with the civic services that can help them survive. These negotiators, operating illegally between the people and the administration, aim at taking over the political space for themselves and in the process edging out politicians, whose prosperity lies in more legitimate activities. But the state must hold itself responsible for establishing an administrative system that forces the lumpenisation of political spaces. If social cohesion is to be promoted in multi-religious neighbourhoods and the growth of social amorphousness brought to a halt, there is clearly a need for neighbourhood-level institutions and for mechanisms to promote dialogue and discussion between the different religious communities. When pounded by wild rumours on one hand and on the other, by the provocative information beamed by satellite television, itself a product of modern technology, a neighbourhood must have its own cushions and systems to absorb the blows to its social cohesion. Especially needed are communication channels to deal with inflammatory information so that communal passions are bridled. Bhagalpur, Bhiwandi and Okhla show this can be done. Communal harmony clearly cannot be handled exclusively as a law-and-order problem. In its reliance mainly on the law-and-order machinery, the Indian state has neglected the promotion of community initiatives. It has focussed its attention mainly on developing and marshalling its own strength, often at great expense to the exchequer. Nevertheless, in times of crisis, a constant complaint of law-and-order authorities is that their resources are inadequate. Not unlike a forest department that would like to post a guard at every tree or of wildlife agencies clamouring for virtually a guard for every tiger, the police would like to station a picket at every Hindu house in a Muslim-dominated neighbourhood and vice versa. Even if this was not clearly impossible, it still does not guarantee protection because with the communalisation of the political process, there is no guarantee that the law-and-order administration will remain neutral. Because forest guards alone are no guarantee that a forest can be saved, environmentalists have sought a solution in what they call "social fencing". Their experiences show natural resources can be protected, used and shared in a disciplined and cooperative manner not because of state fiats but through village-level negotiations, discussions and bargaining. And because protection of the environment gives greater economic returns to the entire collective, divisive issues are sought to be resolved through consensus. This is definitely not the "Amitabh Bachchan-Bollywood" approach, which features a superhero who is a lumpen at one level, ever ready to fight and smash, but an angel at another, equally ready to protect and nurture -- while everyone else in the film waits and watches. Political parties have no fear for such superheroes because they do not exist in real life. And the public, just as in a Bombay film, remains, passive listeners and watchers. For politicians, consensual, neighbourhood-level initiatives pose a serious threat -- that they will encroach on their political space and diminish the politician's role as power and resource broker. Properly nurtured, community initiatives demand increasing space and will not be satisfied by acting only to preserve communal peace and harmony. Women's groups organised by the Chipko movement to undertake afforestation have expanded and taken up other social and economic issues, which, in turn, means the state machinery faces the inevitable and unhappy prospect of vacating even more "administrative spaces". No wonder then that the Indian state has never attempted to build an intermediary tier between itself and the individual. The neighbourhood, which is the level at which participatory politics can take birth and grow, is the level which allows the individual to participate and negotiate directly instead of as a merely passive voter. It has been consistently neglected in the building of development institutions in the post-Independence period. If community-level initiatives have emerged at all, the state's response has been mainly to limit them sectorally and temporally. In effect, when a neighbourhood initiative has been taken to preserve communal harmony, the bureaucracy has generally preferred to see it restricted to a single issue and to the period of crisis. Beyond these parameters, a neighbourhood initiative however powerful is treated by officialdom as a nuisance and dealt with in a patronising fashion. Only social processes can deal with technological progress and absorb it in a way that maintains cultural diversity -- with equal respect for all cultures. Proud Hindus must learn to coexist with proud Muslims, just as harmoniously as proud Gujaratis must learn to coexist with equally proud Nagas. This is not simply a matter of education and knowing about each other's rationality and respecting each other's modes of behaviour. That, too, is important. It is also a matter of live mechanisms that promote dialogue and discussion between neighbours of different cultural, religious and other perspectives, so that mutually beneficial adjustments can be promoted. A million dialogues in a million neighbourhoods will generate far more integration, mutual co-existence and social stability than dialogue amongst only the national political parties. And, furthermore, if dialogue among the political parties fails, it will be the absorptive capacity of the million, neighbourhood-level dialogues that can preserve stability.